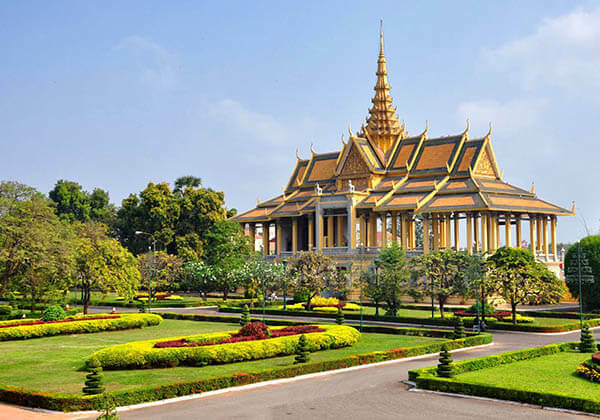 Cambodia’s Royal Palace is considered a pearl in the heart of Phnom Penh, a combination of permanent structures including many towering towers which is a distinctive style that nowhere can obtain of this country. The Royal Palace was built in 1866 after King Norodom relocated the capital from Oudong to Phnom Penh. The official Khmer name is Preah Chaktomuk Barom Reachea Vaeng Chaktomuk. Until 1871, the palace was completed, but until 1873, the surrounding wall was completed and the whole building was officially completed. Years later, some other works continue being built or being demolished to construct new works such as Chanchaya Pavilion and Throne Hall. The palace is where the King and the royal family members live and perform important rituals of the nation. The works in the palace are decorated very elaborately with exquisite patterns along with the colorful flower garden making the palace always a destination not to be missed by many tourists exploring the country of pagodas and temples, Cambodia. 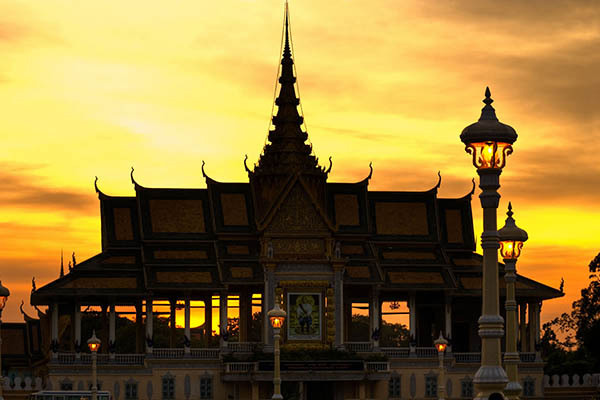 Royal Palace complex of Cambodia covers many splendid buildings located in the center of Phnom Penh. The entire building is separated from the road by an outside wall with unique sculptures. 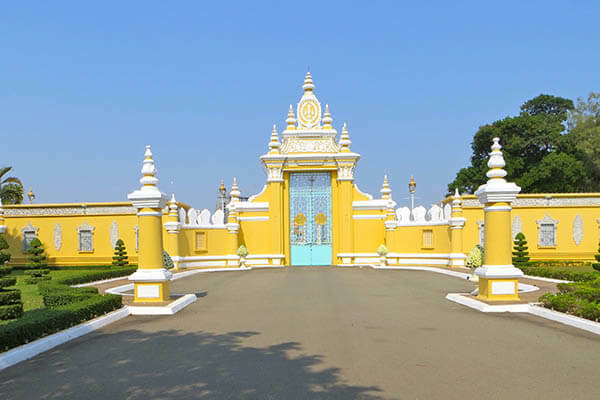 Currently, except for the living area of the Royal family, Khemarin Palace, other places in the Royal Palace and Silver Pagoda is open for visitors. The main entrance to the Royal Palace is situated on the Sothearos street. Visit the Royal Palace, there are many outstanding features that admire visitors. The most attractive one is Silver Pagoda, located on the right side Royal Palace, a place to keep the priceless treasures of Buddhism; as well as the history of various items from different reigns of kings; especially gold Buddha statue carved in 1906. In addition, this is also where the king heard the monk preaching; as well as the organization of solemn ceremonies. Unlike the ancient beauty, and the sacredness of the Silver Pagoda, the very own beauty of Throne Hall attracts anyone’s vision when this place becomes very bright in the morning because of being built in East direction towards sunrise. Moreover, vaulted ceilings are decorated with unique patterns and artistic legends along with a bronze statue of King Sisowath which make viewers admired due to its outstanding beauty. If Throne Hall expresses the splendor, the Phochani Pavilion brings a very quiet and pretty close beauty. Inaugurated in 1912, the Phochani Pavilion is a huge stage used for the purposes of performing royal arts. Today, this place was used primarily as a place to welcome and organize royal conferences. Besides the Royal Palace also has many other buildings that tourists can visit. Specifically, Chan Chhaya Pavilion is where the royal dance is performed, the big parties are organized, and sometimes where the king speaks with citizens. 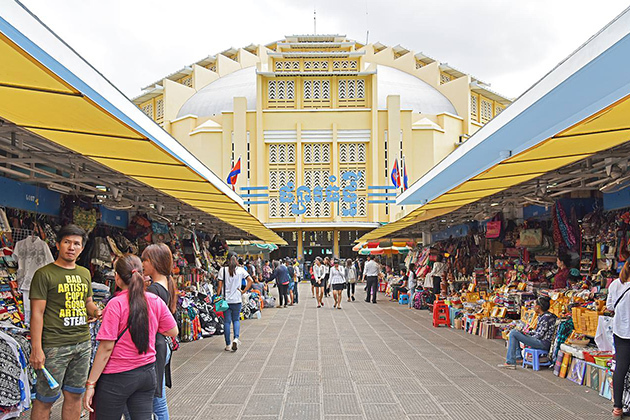 Hor Samran Phirun used to the resting place of the King, and it has been remodeled as a gallery of gifts from foreign leaders. Hor Samrith Phimean is a gallery of costumes and objects of royal symbols. Napoleon III Pavilion has a quite different architecture compared to the surrounding Khmer style, showcasing photographs and memorable events of the country. 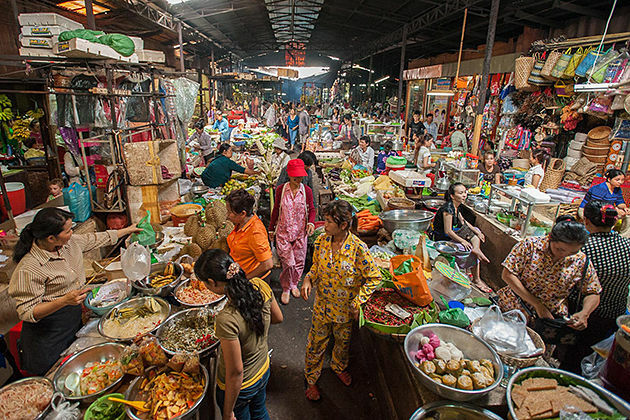 Damnak Chan is used as a workplace of the king, it has a blend of Western architecture and traditional Khmer art. And, Flower garden gathers many precious and unique flowers boosting the beauty of the Royal Palace. If tourists have an opportunity to tour abroad, visit Indochina will be an amazing trip for you. In Cambodia, experience the real beauty of the Royal Palace will be much better than hearing or reading in document paper. The charm of the Royal Palace lies not only in the magnificent or superficial characteristics but also in the quintessence of architecture and culture of the Khmer which was carefully stored in each line of this structure.